At the end of every Yoga class, together we chant the Pavamana Mantra, from the Brihadaranyaka Upanishad. "May I be inspired to keep moving from the untruth (or misunderstanding) into the truth, from darkness (ignorance or fear) into the light, transforming suffering into bliss." Please note that this is my liberal translation. Feel free to compare with others to enhance your own interpretation. We chant it very simply, in the style I learned in my Yoga Teacher Training at the International Sivananda Yoga Vedanta Centres. In my classes, we chant it accompanied only by the peaceful drone of the Shruti Box, but there are many other more orchestral versions which you may enjoy listening to or chanting along with. The first version is an epic musical performance, most famous for appearing in the end credits of The Matrix and the second is a gentler, more traditional rendition from Ravi Shankar and George Harrison. Namaste University of Alberta, PAC 156! Thank you for inviting me to your class on Monday to present a brief "Introduction to the Language and Literature of Yoga". In addition to this post from 2016 which I mentioned in class, you may like to check out this post from my lecture in 2015 which includes links to both of the chants we sang, a little bit about how yoga became popular in the west, and further explanations of the main paths of yoga. If you have time, also check out this recording and transcription of Swami Satchidananda at Woodstock! 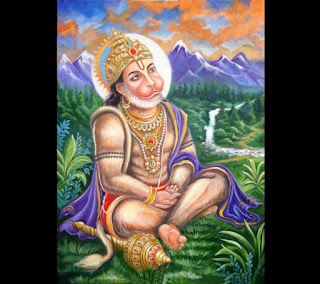 And to elaborate on the example I gave in class, of how the theory of yoga can enhance your practice, take a look at this new post about Hanuman and the asana that mimics his great leap to Lanka. In summary, Yoga offers a whole tapestry of methods to enhance physical, mental, and spiritual well-being. Aside from the well recognised physical benefits of Hatha Yoga, the Sanskrit language and foundational literature of yoga present numerous threads of insight into how we can live peacefully in a stressful world by developing our strength, flexibility, and resilience. Songs, stories, myths and legends engage us in the lively timelessness of the oral tradition, and yoga's theory/practice continuum. I encourage you to stay curious in your yoga practice. You never know what will resonate with you until you experience it. As they say in India, "Sab kuch milega! ", "Everything is possible!". Many of you have expressed appreciation for the soothing sound of the Shruti Box I play during Yoga classes. In the key of C, the drone is said to mimic the sound of Om or Pranava, the highest sound vibration, promoting feelings of peace, relaxation, harmony and unity, a valuable tool for overcoming suffering and the sense of limitation or maya. While there is no substitute for live music, this recording on YouTube is a pretty good substitute. It is a high quality recording, and long enough to use for meditation, chanting or overtone singing. One of my students even suggested using it instead of an alarm clock in the morning. What a great way to get up on the "right side of the bed"! Some things in life don't come easy. Hanumanasana is one of them. Known in English as "the splits" Hanumanasana requires considerable flexibility in the legs and back. It is a posture that demands your complete physical attention and yet may only become an asana when you bring more to it than mere physical effort. Hanuman is a popular character in Hindu mythology. In the epic Ramayana, it is Hanuman the monkey who locates the kidnapped princess Sita and leaps across the ocean between the southern tip of India and the island of Lanka to deliver a message of encouragement and hope along with her husband's ring. Similarly, on the mat, the posture that mimics Hanuman's giant leap demands patience, persistence, steady breathing, truthfulness and positive intention. "To start the journey, I needed firm intention." Hanuman said. "To make the leap I needed strength and courage. To overcome the obstacles along the way, I needed flexibility and cunning. To find you, I needed perseverance. To speak with you and win your trust, I needed patience and discrimination. Through Lord Rama's grace, I found all these qualities within myself, and was able to complete this journey." Quote from "Hanuman's Great Leap"
You can learn more about the mythology behind Hanumanasana here. If you would like to experience this exhilarating posture for yourself, please check out this blog post first, for some great tips and warm ups.